This stone stele depicts the four-armed god Vishnu holding his attributes of the mace, discus and conch, while his fourth hand makes the gesture of beneficence (varada). The various incarnations of Vishnu appear in the small scenes above his two attendants. The style and use of polished black schist suggest that this figure is likely to have been the work of the extremely prolific Pala school of sculpture, which flourished under the rule of the Pala Empire between about AD 800 and 1100. This figure of Vishnu is listed in The Book of Benefactors at the Museum as a gift from Sir William Hedges in 1690. The entry notes that it was originally acquired from a temple on Sagar Island, which lies in the Bay of Bengal. Sir William Hedges was appointed as agent and governor of the East India Company’s establishments in the Bay of Bengal in 1681. He kept a diary during his three turbulent years in India in which he recounts a trip to Sagar Island on 13th March 1683. He was awarded a knighthood in 1688 and never returned to India. Lent by the Pitt Rivers Museum, Oxford. (Presented to the Ashmolean Museum by Sir William Hedges, 1686). Steles of the latter part of the Pāla-Sena period (8th to 12th century), carved out of the characteristic dark siltstone from the Rajmahal hills in Bihar, are probably more numerously represented in museums than any other type of Indian sculptures, with the one exception of Gandhara work also in a highly characteristic stone. This representation of the god Viṣṇu is a particularly fine example, without a trace of damage. It is also an important document in the history of the dissemination of Indian art throughout the world. The four-armed god stands, richly crowned and bejeweled in samapada, the rather rigid posture much favoured for central figures by Pāla sculptors. His upper right hands hold the mace and the discus, his lower left the conch and his lower right hand is outstretched in the boon-giving (varada) gesture with a lotus blossom carved on the palm. The long floral garland (vanamālā) usually adorning the god sweeps down to below his knees. Below the shoulders, the image of the god is actually cut out from the ground, a technique much favoured in this style. Much of the interest of this sculpture derives from the rich carving of the surround, both because of the profusion of iconographic detail and the liveliness of the two attendant female figures, whose more sinuous poses compensate for the stiffness of the central figure. On the proper right is Śrī Devī, holding a fly-whisk, on the left Puṣṭi (Sarasvati), holding a musical instrument (here a vīṇā). At the top of the stele a small kīrtimukha (face of glory) gathers all the relief elements to a point. Below are two vidyādharas , holding shield and sword [see EA1985.5]; then, on each side, a vertical series of little panels depicting the various incarnations (avatāras) of Viṣṇu, at this period usually counted to be ten in number, including the Buddha and Kalki on his horse. Below Viṣṇu’s double lotus pedestal is a miniscule Garuḍa and two equally minute figures, one of which is perhaps the donor. Despite its condition and the particularly crisp quality of the carving, this Viṣṇu would only be regarded as one of many Pāla sculptures, imposing but somewhat metallic in their precision, were it not that its acquisition in 1686-7 by the newly founded Ashmolean Museum is documented in detail, along with its probable find-place. In 1690, The Book of Benefactors records in Latin that Sir William Hedges gave an image (idolum) of “Gonga” from a temple on the island of Saugor (or Sagar) at the mouth of the Ganges. The name “Gonga” was at first a stumbling block, since it suggests the goddess Gaṅgā, widely worshipped in Bengal, until passages in the mid-17th century treatise by a Dutch missionary indicated that amongst Europeans in eastern India, the name Ganga could refer to any male Hindu god or “devil”. Moreover, Hedges, who for three turbulent years was governor of the East India Company in Bengal, kept a diary in which he records that on March 16, 1683, “We went in Budgeros [a kind of local boat] to see ye Pagods at Sagor”, which is indeed at the entrance to the Hooghly River, the mouth of the Ganges by which ships pass up to Calcutta. It is most likely that Hedges combined sightseeing on that day with a little collecting. Where in Benhal the image was carved is not known (the stone in any case had been transported from more than 200 miles away), although certain iconographic and stylistic traits indicate an origin in south-east Bengal or southern Bangladesh. What is certain is that Hedges had actually set foot on Saugor and that he was personally familiar with the kinds of images to be found there. An equally fine Pāla image (of Sūrya) in the Philadelphia Museum of Art is also believed to have come from Saugor. 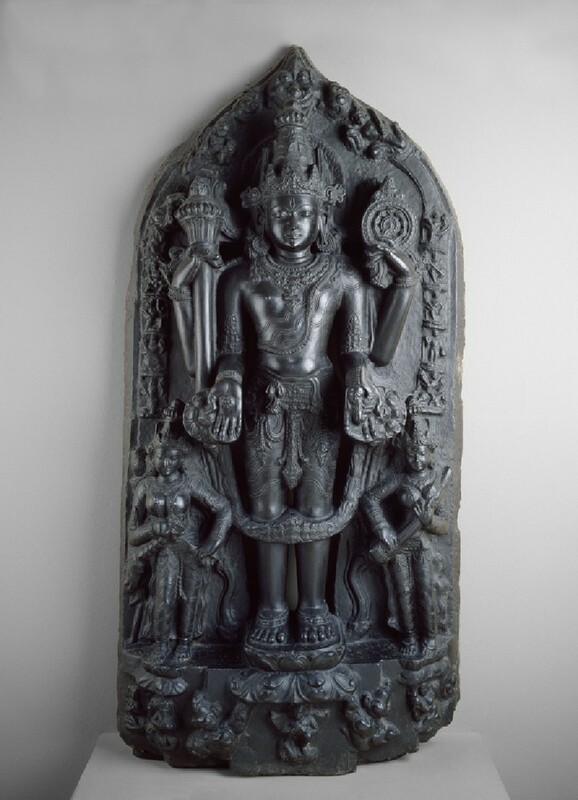 So far as is known, this Pāla Viṣṇu is the first major Indian sculpture to have been acquired by a museum in the West and which can be identified today. Although it is on permanent public display in the Ashmolean Museum, it is officially on loan from another of Oxford University’s museums, the Pitt-Rivers, having been transferred there during the rationalization of 1886, long before the Department of Eastern Art was created in the Ashmolean.